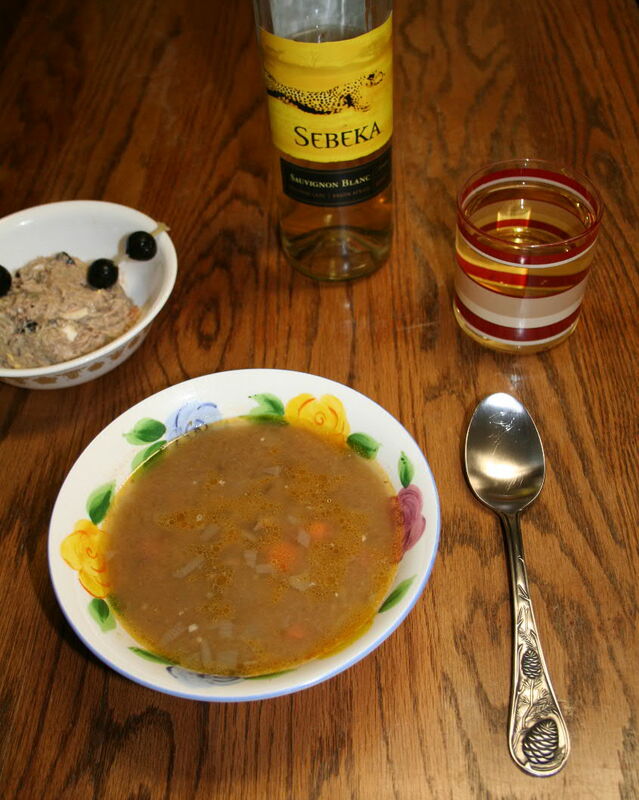 Coot soup and carp salad with a bottle of $3.00 wine for the author's New Year's meal. To bring to end what has been a year where the nation has been battered by economic woes and wars, I could think of a no more fitting end-of-year meal than coot soup and carp salad. Three coot. They even look a little like over-stuffed brokers. I take the grey-feathered coot to represent the Wall Street wizz-idiots whose greed took the nation to very-near financial failure and the carp salad to be congresses’ “carping” about every issue, rather than producing much in the way of actions to benefit the average American. 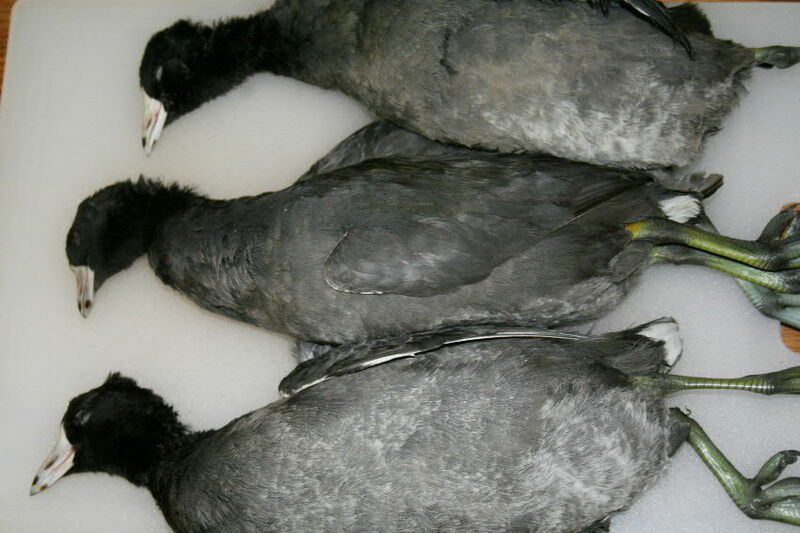 Coot, skinned and the external fat removed, can be boiled with some garlic, rice and a handful of vegetables to make a tasty soup. I use the entire carcass along with the cleaned gizzards and hearts. 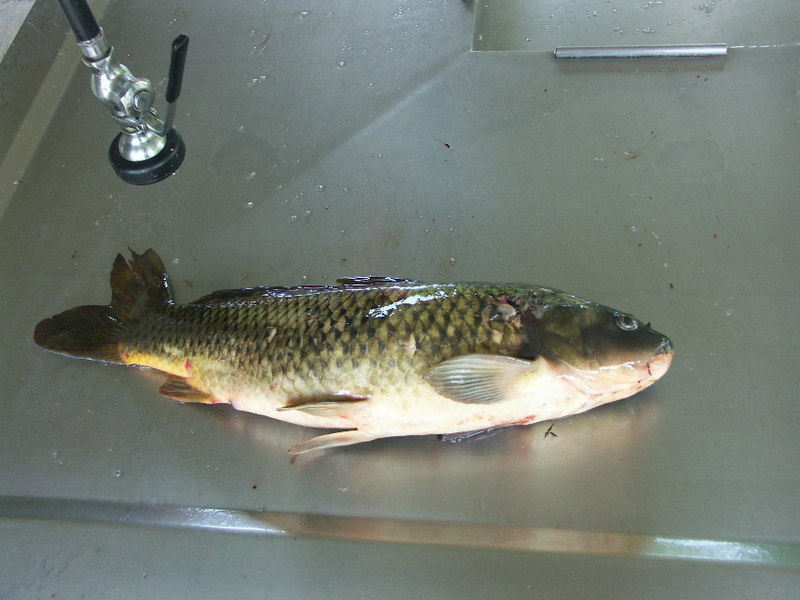 Bottom-feeding carp were an appropriate addition to the meal. mixed with mayonnaise, pickles and a bit of dill weed along with an egg. The result is a better product than typical tuna-fish salad as it does not have the oily aftertaste. I found the preparation of this meal very satisfying, particularly boiling of the coot and stripping the meat from the bones. The limit on coot is 15 a day, there is no limit on carp; and the result was a good and inexpensive New Year’s meal – ironic through it might be. For more recipes go to http://www.hoveysmith.wordpress.com . There are also recipes in my books, Practical Bowfishing, Crossbow Hunting, Backyard Deer Hunting:Converting deer to dinner for pennies per pound and in X-Treme Muzzleloading: Fur, feathers and dangerous game with muzzleloading rifles, smoothbores and pistols.